Sykes Pumps and its engine partner Lister Petter Engines UK, continue their strong bond. Khansaheb Sykes new pump build division completed an order of 10 x Genuine Sykes WP150 -60 dewatering pumps powered by Lister Petter TR3 Engines for an Oil & Gas client based in Abu Dhabi in the agreed time frame and just in time for the rainy climate. 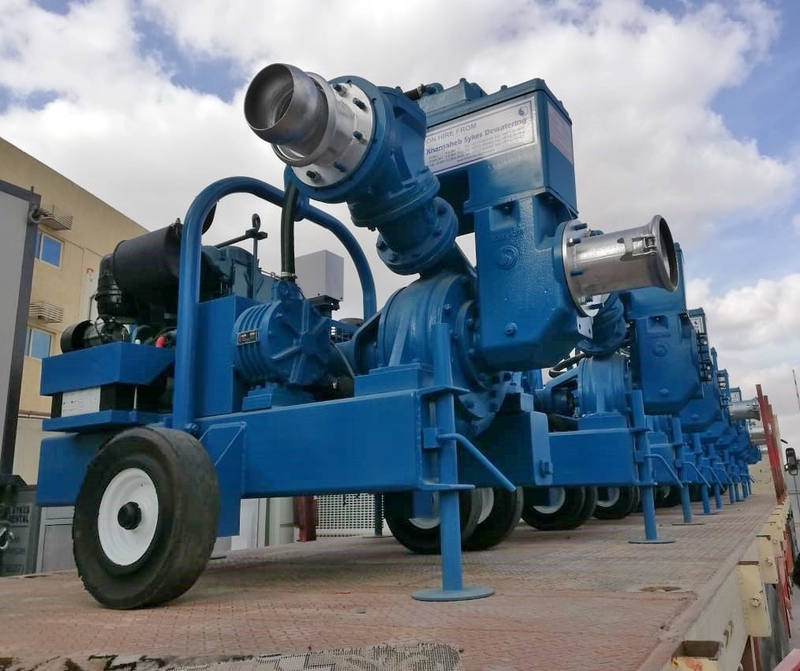 Khansaheb Sykes have been established in the Middle East for over 40 years our Sykes dewatering pumps are the market leader within the UAE and throughout the GCC via our established dealer network. 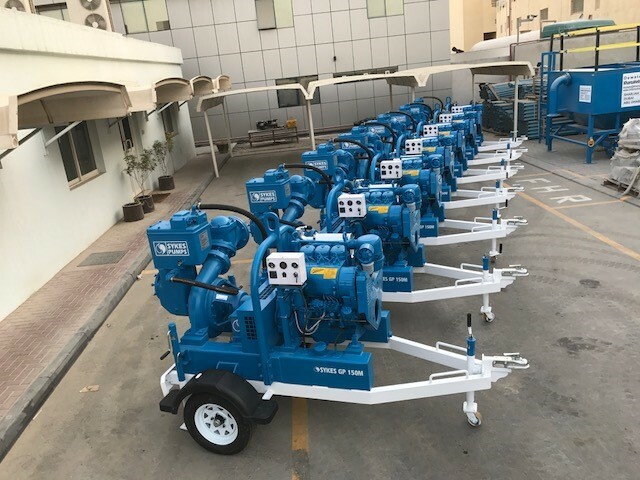 To know more about our extensive range of dewatering pumps our equipment fleet for all dewatering applications , call us on our toll free 800 79537 or click here to arrange a site visit to our yard. Newly fleeted Sykes GP150 dewatering pumps heading out for a Ballasting Project in Dubai, not sure if the paint had even dried! The Sykes dewatering pumps can be utilized on several applications, not only as a WellPoint dewatering pump. With an open impeller design they are suitable for moving sewage water, as booster pump on dewatering projects where the discharge point is not in close proximity to the project site and for general pump hire. On this occasion 10x Sykes GP150M dewatering pumps are being used on an off -shore ballasting application. 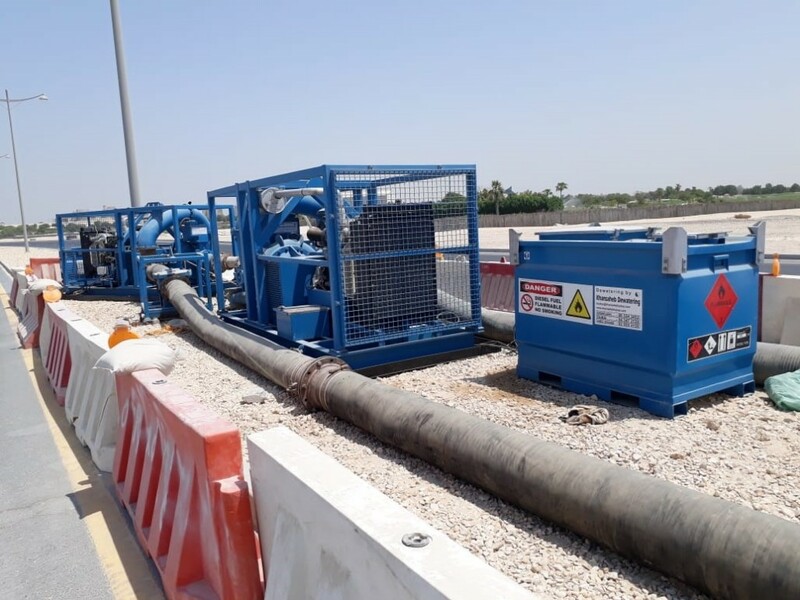 Khansaheb Sykes again met customer expectations with its bespoke dewatering pump hire, ensuring that we always supply the optimal pumping solution for any project no matter how big or small. Khansaheb Sykes stand as the market leader in the dewatering pump hire sector throughout the Middle East and GCC. For enquiries, regarding your dewatering pumps or dewatering solutions requirements. Call Toll free 800 SYKES or visit our web site www.khansahebsykes.com. Khansaheb Sykes was contacted by a main contractor to provide pumps to flush a dormant chiller network prior to its commissioning. Our response was to mobilise 5x Sykes 12” Pentair Diesel Dewatering Pumps along with bunded fuel tanks and all associated accessories to connect to the Chiller network. The Sykes Pentair 12” diesel dewatering pumps have the capability of, maximum duty flow of 1450m3/hr & maximum duty head of 45m. Dynamic testing was carried out before the chemical dowsing procedure. The pumping solution provided by Khansaheb Sykes works fault free – underling our ability as a pump hire specialist and being able to respond to any solution. Khansaheb Sykes are known to provide the most reliable and efficient dewatering pumps within the pump industry. To Further cement our presence, Khansaheb Sykes are in the final states of securing a trading partner in Yemen, who will offer the full scope of Sykes Dewatering Pumps. 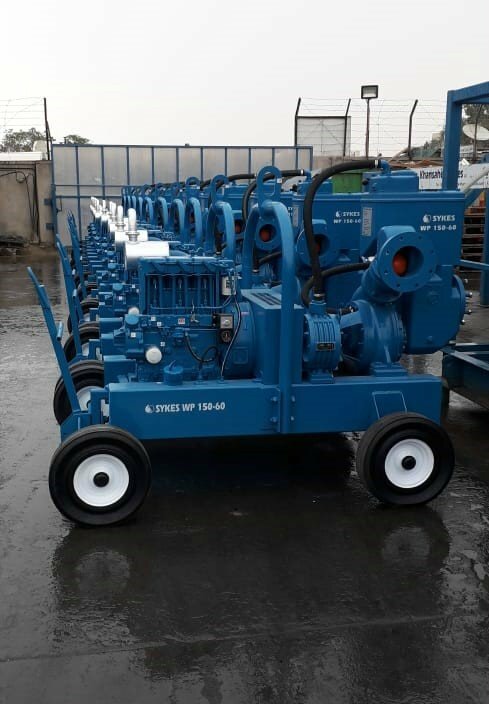 The first delivered order was for 4x Sykes GP150 Dewatering pumps powered by Kirloskar 3 cylinder Air Cooled engines and 4x Sykes WP150 Dewatering Pumps powered by Lister Petter TR3 Air Cooled engines, additional pump orders are currently under production. Genuine Sykes Pumps are renowned within the market place and are a trusted manufacturer of Dewatering Pumps, with an ever growing range to compliment the fleet of Khansaheb Sykes to include, general purpose dewatering pumps, drainage, wastewater, sludge, borehole, hydraulic, super silent, high performance and air pumps etc. 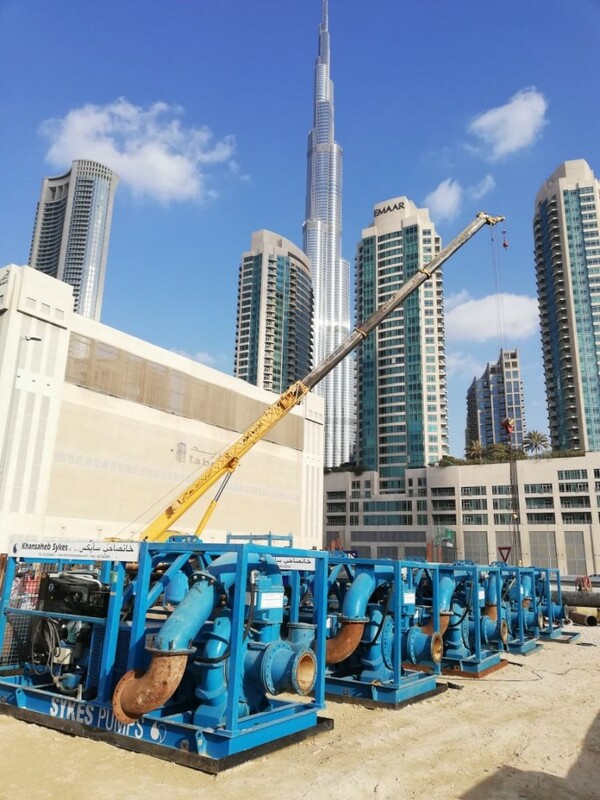 Following on from the success of the Sykes environmentally silt separation system, Khansaheb Sykes have introduced the same unit into their rental fleet for the UAE / GCC region. In the majority of cases, water pollution is caused by the presence and prolonged build-up of sediment, silt and other abrasives which puts mounting pressure on our clients to ensure discharged water is as silt free as it can be before being reintroduced to a storm water network or directly back into the sea. Increasing requirements for companies to take their ecological obligations seriously has led to Khansaheb Sykes adding a this new environmentally friendly product to our extensive hire fleet – the Sykes Silt Away. By deploying a Silt Away unit on site, customers can be confident of avoiding substantial fines and adverse publicity, as well as suffering enforced closures. The unit has been designed for use in conjunction with the Sykes range of 6” dewatering pumps (150mm). As water is pumped through the Silt Away, it is filtered allowing the sediment and solids to be collected and contained within the unit. In heavily contaminated situations, customers can connect two Sykes Silt Away units in series to ensure that the discharge is successfully cleansed. The implications of failing to observe environmental regulations are far-reaching and range from damaging natural habitats, killing wildlife and even blocking sewers. It is of huge importance that projects are completed within designated timeframes, but without compromising the safety of any given location. Speaking prior to the unveiling, Sykes Pumps sales director Chris Graham, said: “From listening to customers, we have designed a product that is both safe and easy to operate. Features like a hinged discharge chamber opening and dedicated flushing points facilitates easy emptying and cleaning. For more information the Khansaheb Sykes Silt Away or our extensive range of Dewatering pumps. Call our Toll free 800 SYKES or visit our web site www.khansahebsykes.com. 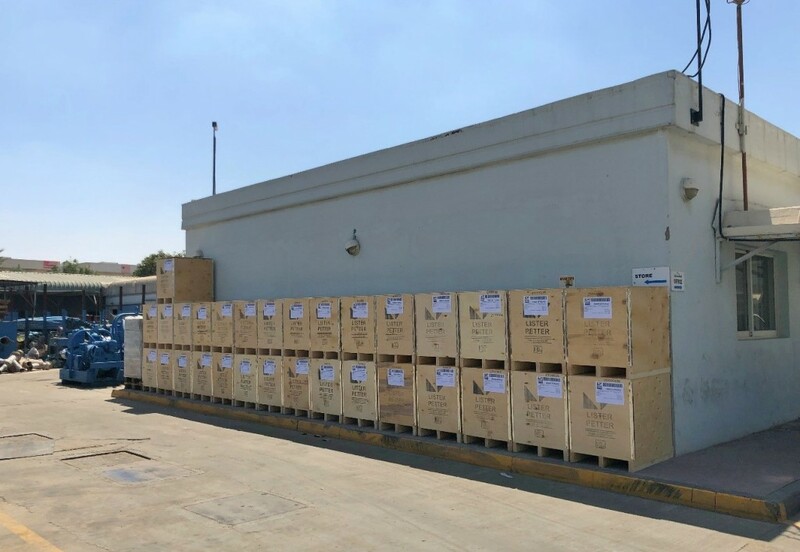 Generators awaiting PDI and deliver to Khansaheb Sykes workshops are the first phase of 2019 Capital Equipment Expenditure are, 6x Q65QS & 2x Q115QS. The new fleet additions will further enhance our rapidly growing generator fleet where they will provide power on a number of dewatering applications. At the heart of the generator range is the JCB 4Cylinder Dieselmax Engine providing the power, delivering low fuel consumption, increased efficiency and low noise to deliver a superior performance, even in the harsh Middle Eastern climate. 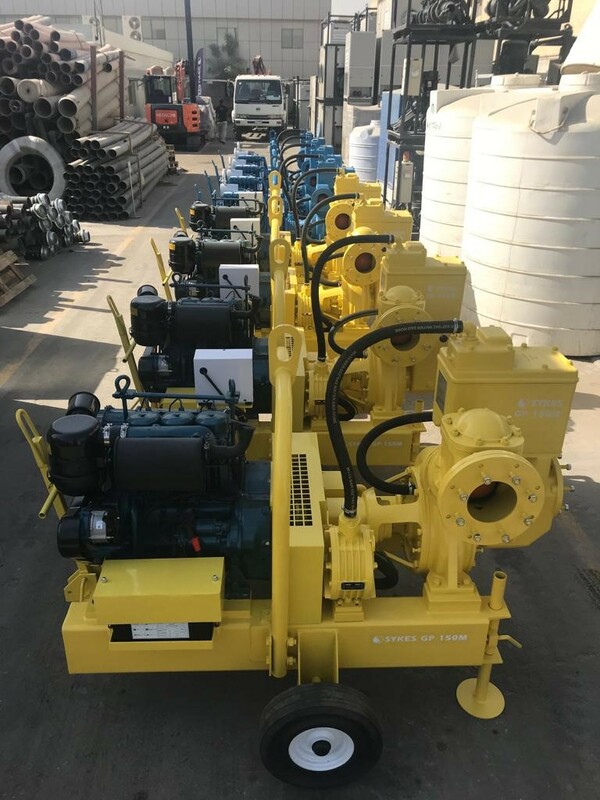 These new generation generators will complement our dewatering pumps division, whether it be running on a deep well or well pointing projects, to powering our electric submersible dewatering pumps. Khansaheb Sykes has been serving the UAE since the last 40 years we will continue to provide you with efficient and effective dewatering solutions with the most up to date equipment. Khansaheb Sykes are known to provide you with the most reliable and efficient dewatering pumps. Our presence in the Middle East for over 4 decades has made us the leading and trustworthy dewatering pump supplier in the MENA region. 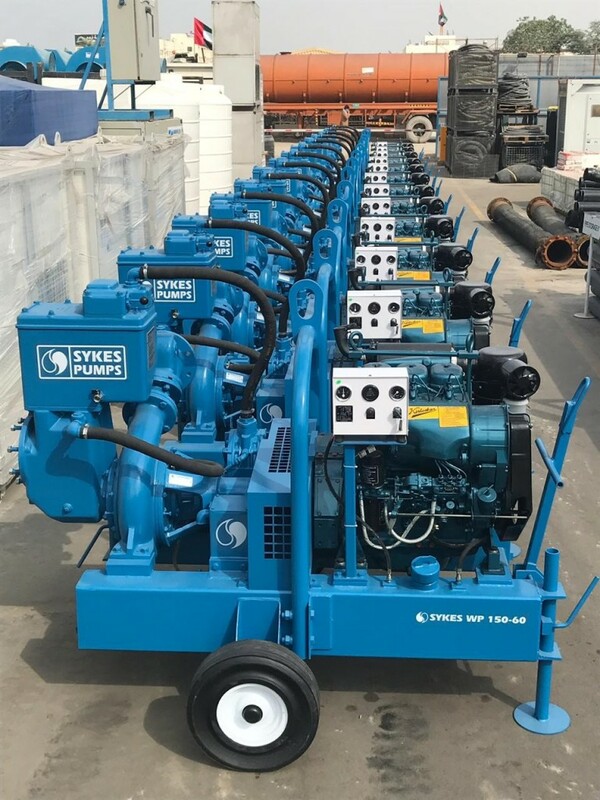 The Sykes brand of pumps are renowned within the market place and are a trusted manufacturer of Dewatering Pumps, with an ever growing range to compliment the fleet of Khansaheb Sykes to include, general purpose dewatering pumps, drainage, wastewater, sludge, borehole, hydraulic, super silent, high performance and air pumps etc. To know more about our range and fleet of equipment call us on our toll free 800 79537 or click here to arrange a site visit to our yard. Khansaheb Sykes are known to provide you with the most reliable and efficient dewatering pumps. Our presence in the Middle East for almost 4 decades has made us a leading and trustworthy dewatering pump supplier in the MENA region. 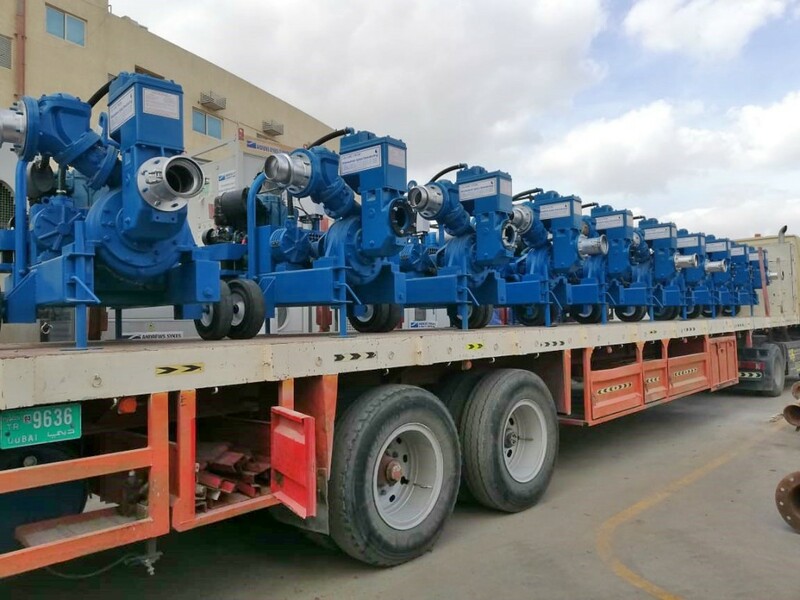 Following on from a successful delivery of an earlier dewatering pump order, Khansaheb Sykes were most grateful to receive another order for purchase of our popular Sykes GP150 dewatering pumps on a road towable trailer again from a local UAE Government Department. Our sales engineers arranged for the units and then delivery and dispatch was scheduled. The Sykes brand of pumps are renowned within the market sectors and are a trusted manufacturer of Dewatering Pumps, with an ever growing range to compliment the fleet of Khansaheb Sykes to include, general purpose dewatering pumps, drainage, wastewater, sludge, borehole, hydraulic, super silent, high performance and air pumps etc. 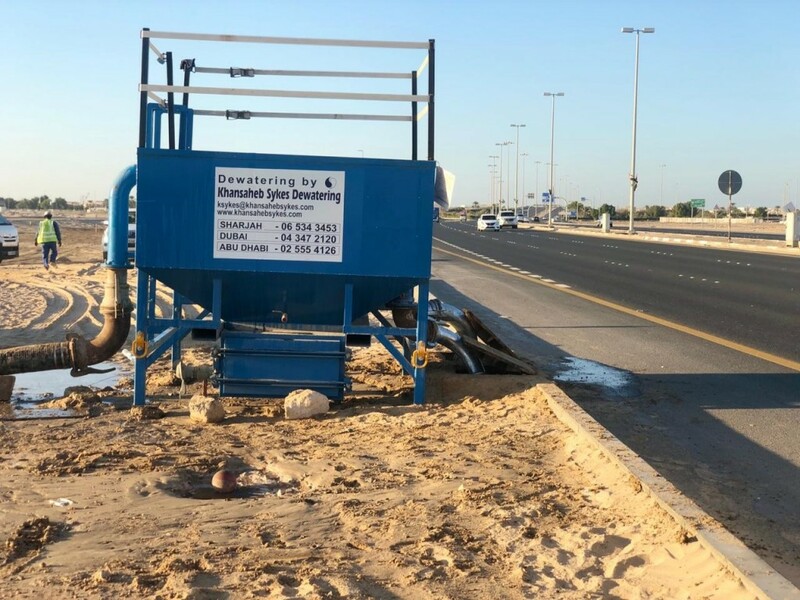 Khansaheb Sykes the UAE’s longest and most established Dewatering Solutions provider and Ground Water Control Specialist was recently awarded a dewatering project in the Emirate of Abu Dhabi which consists of a WellPoint Dewatering project covering a distance of approximately 15km. As a result to our success on a similar project with the same Client then awarding of the project to us was straight forward. 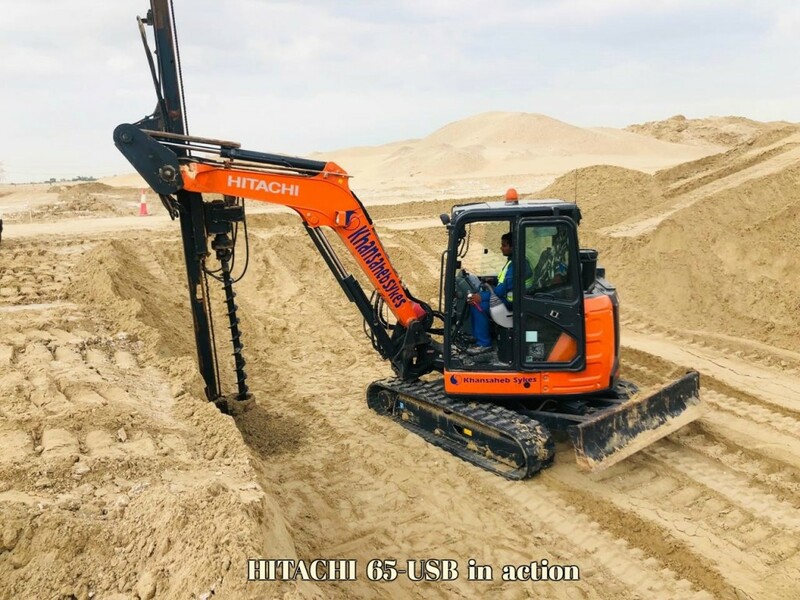 Due to the eagerness to commence dewatering activities, a standalone drilling machine has been mobilized to site to commence drilling works before complete mobilization of the dewatering pumps and their associated accessories. Khansaheb Sykes unique straight mast design allows drilling to a depth of 7.5mts in one continuous movement. For more information on our range of range of dewatering pumps Drilling Machines, Sewage Submersible Pumps or our extensive range of Dewatering pumps, please call our Toll free 800 SYKES or visit our web site www.khansahebsykes.com. Khansaheb Sykes was contacted by a site main contractor to provide emergency over-pumping so that vital maintenance of a sewage network could commence. Our emergency response was to mobilise 2 of our Sykes 12” diesel dewatering pumps along with bunded fuel tanks and all associated accessories. The Pentair 12” diesel dewatering pump has the capability of, maximum duty flow of 1450 cubic meters per hour & maximum duty head of 45m. This emergency over-pumping solution worked perfectly, with the contractor being able to carry out their maintenance works fault free – underling our ability as a pump hire specialist and being able to respond to any emergency.